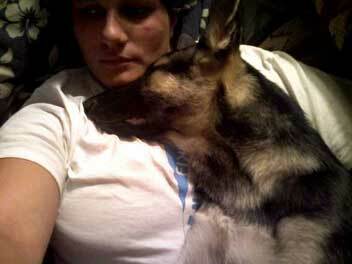 My name is Tiffany and my family of 4 rescued 2 sister GSD's in April of 2010. When we brought them home they each picked one of our daughters, who were 3 and 5 at the time, and took the ride home in their laps of their car seats. personalities to match each of our daughters. at least having the girls trained to be able to take to schools as they love to be around people just still a little rough around the edges. Lol. 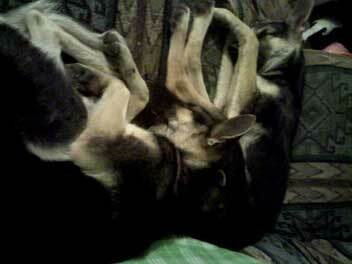 I had adopted a male GSD for my husband who had been raised with Shepherds all his life for his birthday in 2009. Our oldest daughter came down with a bout of phenumonia the following February and had to be hospitalized for a week. late one evening saying that he was gone, that she had let him out with her Rottie and he just disappeared. I had called all the local law enforcement agencies and dog catchers and even informed our vet since he was microchipped and reported him missing. our boy up for adoption and he was just a couple miles from our house. After talking to the place that was holding him they flat out told me that we would not get him back that he never had his shots and was malnurished and they also said he wasn't ours. Even after I had sent pictures of him taken just a few days before he had went missing. They ended up adopting him out to one of their workers which broke my families hearts. 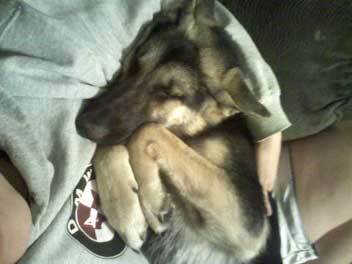 I would not trade my German Shepherds for anything. They are my other daughters and til I die Bo will always be my son. Thank you for taking the time to read this. I hope you had a happy holiday and great new year. First Pic is Abby, second is Both of the girls asleep on the couch and finally is Ziva. They believe I am a couch. informed our vet since he was microchipped and reported him missing. If he was microchipped and had all his shots I don't understand why the microchip didn't work. Secondly, had you had the microchip checked since you had adopted him. Another words did what you think was on the chip prove to be what was on the chip. If all you say is true I would never give up. In saying that I feel bad for you. I've now had 7 German Shepherd Dogs. I have been told that my house is safe because of the dogs. Truth is the dogs are safe because I know what people do to dogs and I take every measure to protect them. Keep your hope up and pray. Don't ever give up! !